Writer-director Matthew Hope delivers an unflinching portrayal of the modern elite soldier, as seen through the eyes of Jack Collins (Milo Gibson), a battle-scarred ex-Navy SEAL operating as an assassin for the CIA. As part of a three-man team, Collins is sent by his handler (Sylvia Hoeks, 'Blade Runner 2049') to London and tasked with hunting down a disavowed CIA Operative before he procures a WMD from Russian gangsters. With countless lives at stake, the manhunt begins - but Collins will discover that a former colleague and a team of private soldiers stand in his way. The 'All The Devil's Men' competition has now closed. Winners will be announced shortly. Competition opens at 5pm AEDT on Sunday 3rd February 2019 and closes at 11:59pm AEDT on Sunday 10th February 2019. Five winners will be chosen at random on Monday 11th February 2019. To successfully win, entrants must fulfil the above entry conditions before the time the competition closes. Current members/followers are eligible to enter the competition. Only one entry per person. Only one winner per household. To be a valid winner, the entrant must not have won a prize from SWITCH within the last 28 days. 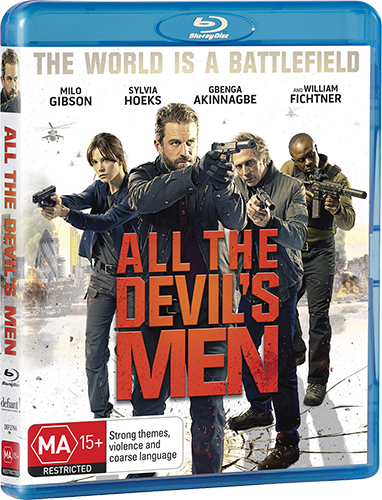 Each winner will receive one Blu-ray copy of 'All The Devil's Men'. By entering, you agree to receive occasional emails from SWITCH in the future. If you decide to unsubscribe from these updates, any further entries will not be applicable. Only Australian residents are eligible to enter. 'All The Devil's Men' is available on Blu-ray and DVD on Wednesday the 6th February 2019 from Defiant Screen Entertainment.